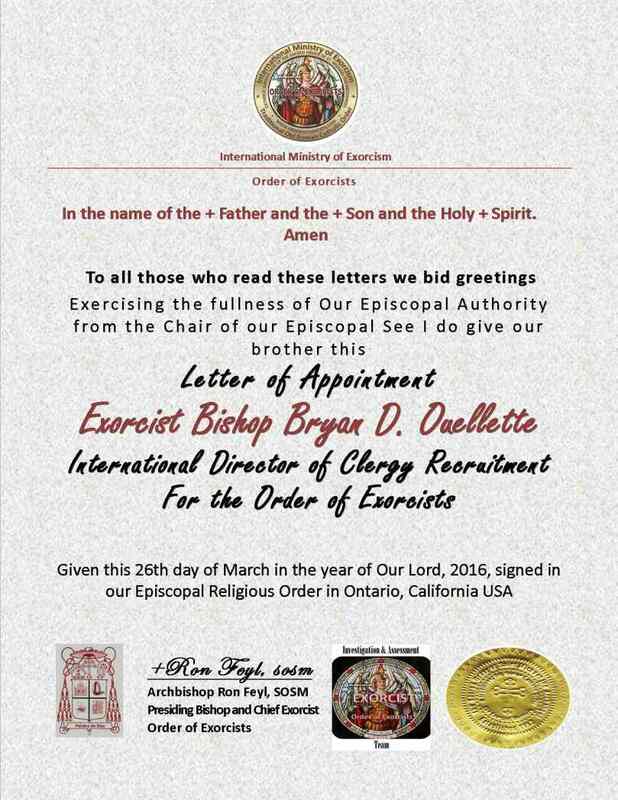 ATLANTA - March 29, 2016 - PRLog -- Archbishop Ron Feyl, SOSM, Presiding Bishop and Chief Exorcist of the Sacred Order of St. Michael the Archangel (Order of Exorcists) appointed Exorcist Bishop Bryan D. Ouellette, Ph.D., SOSM, Presiding Bishop of the Holy Nicholean Catholic Church, to International Director of Clergy Recruitment on March 26, 2016. Moving forward, all clergy who are interested in joining the Order, so as to assist with the great need that is apparent all over the world in working Independent Catholic exoricism ministry, may now contact Bishop Bryan at his office within the Holy Nicholean Catholic Church serving the Atlanta, Georgia area. Please send your cover-letters and resumes to office@nicholean.org. Membership in the order is $65 a year and is used to pay for the administrative costs involved in processing applications and cases. The Order of Exorcists never charges clients. : Holy Nicholean Catholic Church, Inc.
Want to become a paranormal investigator for Atlanta, Georgia?